Hahnemann possessed an extraordinary understanding for the nervous and mental activities of his patients…and [possibly] considered psycho-therapy in certain cases to be more important, more applicable than the use of homeopathic medicines. He also seems to have been far in advance of his time in this province. Everyone seems to agree that he exhibited a fine understanding…for the unfortunate victims of mental derangement, and he acquired a reputation for the same, attracting many patients with mental problems. 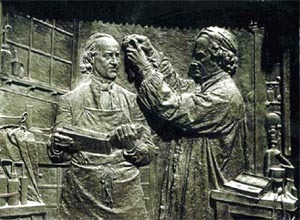 During the two years following his translation of Cullen’s Materia Medica and the epochal Cinchona bark proving in 1790 that derived from it, Hahnemann “continued to experiment upon himself and on his family and certain of his friends with different substances”, but he had not yet tested the truth of this new principle on the sick. The insanity of Klockenbring gave him the opportunity. However, for the first few weeks Hahnemann simply observed Klockenbring without giving him any medical treatment, Klockenbring had been Hanoverian Minister of Police and Secretary to the Chancellery…[and] in his fast life, he developed great eccentricity, but he became the subject of a satire claiming he was a close associate of drunken brothel keepers and that he had “the most dangerous venereal disease and moral vices ranging from drunkenness to fraud,”. As a public figure and family man who could not stand such accusations, he “became violently insane”. Hahnemann integrated his understanding of theology, philosophy and psychology into “The Organon of the Healing Art.” The main sections on homoeopathic psychology and the treatment of mental disorders are found in aphorisms 210 to 230. There are, however, many other references to the use of mind cure. In §17, note 17a, he points out that disease mistunements can be caused by imagination, and therefore, can be cured by similar imagined remedies. In §26 the old homoeopathic psychologist echoes his early observations recorded in the Materia Medica. Vide Organon. 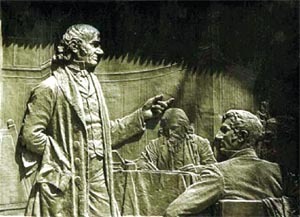 Hahnemann was not unaware of the controversial nature of Mesmer’s work. Specially prepared areas with magnets and magnetic waters, padded rooms with hysterical and mentally disturbed individuals going through catharsis, and others receiving treatments in altered states of consciousness was a bit too much for the orthodox establishment. Nevertheless, Hahnemann saw that the inevitable fanaticism and mysticism associated with the Mesmerists was no obstacle to true cure if the operator was compassionate. Vide Organon §288. For management of the mental patient Hahnemann suggests the use of balancing qualities (raging with quiet fearlessness, silence with attention, disgusting behavior with inattentiveness, etc. Vide §228), but for cure, he points to dynamic psychological similars and homoeopathic remedies. This is similar to the management of patients suffering from physical conditions. The homoeopath covers up those who are cold, gives water to the dehydrated and feeds the malnourished as these are merely physical potencies of the natural world. The spirit-like mistunements of the vital force and mind however, need spirit-like dynamic homoeopathic remedies. Such psychologically dynamic remedies must be applied in a single remedy, given in small potent amounts, and not repeated unnecessarily. All the rules of The Organon apply.